Kirkless Hall Inn is next to the second lock down from the top of the Wigan flight. 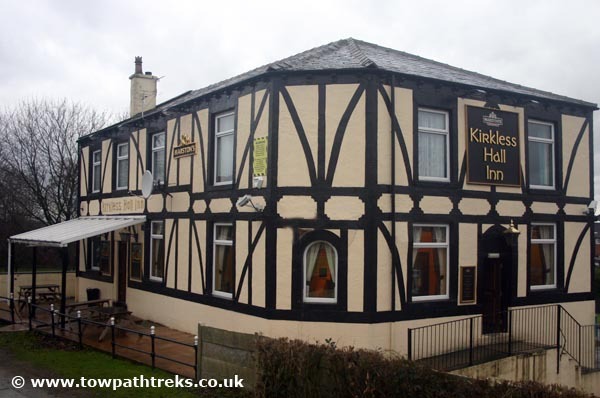 There has been a Kirkless Hall Inn here for over 120 years. It is a large mock Tudor building with two bars. One bar has a pool table and is popular with locals. This is a Marstons pub and has Jennings, Marstons and Banks ales. Serves basic pub food. There is outdoor seating next to the nearby lock. Opens at 12 noon. There is a large carpark. Pub: 6 out of 10 with 15 votes. Beer: 7 out of 10 with 14 votes. Food: 6 out of 10 with 13 votes.